Corruption in the Premier League: Poor-Bert, the next head of the PGMOL? What on earth is wrong with ref Probert? Last year I wrote an article after the Wigan game which was also a Christmas game only 2 days after a previous game. He then screwed us over with not giving a blatant penalty for handball in the last minute. And that after he gave a penalty for a dive outside the penalty box by Nzogbia. The title of my ref review then was : Poorbert Athletic –Arsenal. And now again in the Christmas period ref Probert, or shall I continue to call him “Poor-bert” did us again. I’m not going in to the ref review for now but I have seen things I only have seen done by Dowd last year at Newcastle in the second half. But this time it was done with a remarkable consistency during 90 minutes of football. Now we all ask for consistency from the refs but mr. Poor-bert we don’t mean that you just blow all the fouls in favour of one team and nothing, or almost nothing at all in favour of the other team. I wondered what had to be done by an Arsenal player to win a foul. Well it was helpful on a few occasions that when they were fouled they fell and took the ball in their hands. A few times I was afraid that he might give a foul for a handball but well that far was even a bridge too far for this terrible ref. In the first half Gervinho could be fouled and nothing would be done. The moment of throwing away the mask was short before half time. Djourou won the ball from Riise and then Riise made two fouls on Djourou and one was where he clamped his legs around the leg of Djourou and the ref just waved play on. Two clear fouls on a defender in his own half. What advantage Mr. Poor-bert? Oh you mean advantage because of the fact that Fulham won the ball after the third foul by another player on Djourou when he won the ball again. I then knew for sure that he was doing all he could to prevent us from winning. I think even he couldn’t image that he would be successful at that moment but you could see him thinking: I must do what I was told. Maybe his Fifa badge was at stake? This is a game that was a master class in how to screw a team. In the good old tradition once started by ref Poor-bert his boss Mike Riley when he stopped our unbeaten run at Old Trafford with a shambolic performance which should have had as a result that he would have been kicked out as a ref forever. No, they made such a creature head of the refs. As a wise lesson to the other refs : act like this and you will get your reward. Since then Dean has changed his former good run for Arsenal and is on a mission to make us lose every game he is in charge. Phil Dowd has done the same last season and since then is also on a mission to become head of the refs when Riley retires. But mind you Phil because ref Poor-bert is also after his job in a few years time. His job application form has just been made after proving that he could screw us. And in his CV he also has last year Wigan game as a further recommendation. Is it a coincidence that after our troubles at the start of the season the refs seemingly stopped their destroy job for most of the time but have stepped it up in the last games since it has become clear that Wenger has put us back in contention for at least a CL place? Just as it was last year the job of Poor-bert to stop us at Wigan when we were getting close to the top position? If we need to be stopped, ref Poor-bert is the guy to send to an Arsenal game. When will it stop, refs? Or is ref Poor-bert still pissed off because of the FA apologising for the sending off from Wenger at Old Trafford on the indication of Poor-bert in last season? PS: After writing this I went to my ref review of the Wigan game last season and I found out that in that particular game he just did the same thing and in the same way. 35 comments to Corruption in the Premier League: Poor-Bert, the next head of the PGMOL? things need to be changed, it can’t go on like this forever. I mean Arsenal, the club has to make a statement in the open about their disappointment at the officiating of the refs. Yes, stir the water and stir it hard. Then we’ll see what would, could, be the outcome of it. Of course it won’t happen. When its the deciding game between Manu and Manc to crown the champion, you know where to put your bets. I believe if you put away all the chances that are in front of you, not even the ref , corrupted or not, can deny the score which is in front of millions (including those watching on TV.) SO at the end the only analysis is you play to your best ability. We judge ourselves, have we done all that we could. Gervinho is wasteful in front of goal, Walcott’s performance is under par, Arteta is tired etc. etc., what’s the best strategy ? Numerous questions which beg answers, if the team the manager can honestly answer all, who cares what the refs do or don’t do. Be proactive. Its about time one of the national newspapers pick up your reports and let the whole country know of the corruption in our game unless they already know and have been paid to keep quiet? fair enough we wasted chances but the game turned on its head after poor-bert made a decision only he could make and that was to give fulham a man advantage and given the fact the premier league had already screwed us by only giving us a days rest he knew we were tired and would be unable to hold them off for the rest of the game. What would be interesting to me is would he have given a late penalty if camera hadn’t scored the winner? Im guessing he would! Zamora not camera my predictive text is putting words in my mouth sorry. One wonders what prompted Probert to get Wenger sent off in the first place. Surely that demonstrates a pre-existing bias. Not something that came in because of the FA deeming him wrong. I know Probert cost us the WIgan game last year, but that disappeared in the ref carnage that ensued all season. This one was exactly a Dowd-like performance. I thought it while watching the game. The refs do not want us to finish top 4. They tried it last season too. The Villa game towards the end sticks out in my memory(even though Arsenal started poorly, that is besides the point). Surely there must be some way to legally challenge this nonsense? One ‘technology’ that really must be brought in is that refs should be miked up a la rugby, and have to announce their decisions and the reasons for it to the stadium. It needs no testing to be brought in. No experimentation. Just let us hear what the ref tells the players on the field, and make him explain his decisions to the public who come to watch a game of football and not a ref deciding the outcome of a game. In The Rugby Union premiership, on the monday after the game the ref is taken through hi performance by video, (a la ref review) and each decision (or non decision) is looked at and rated, and his performance properly and accurately assesed. How can someone at the game know for sure whether the Gervinho penalty was right / wrong ? so therefore how do we know that a ref is doing a good / bad job ? I get the feeling that they are almost judged by whether the game was ‘run well’ rather that correct decisions are made, which is ok if your just trying to stop to sunday sides having a row, but not in at this level. Couple this with the fact that the PMGOL wont send a ref to a team or manager who they have ‘history’ with, (note, not whether the ref was wrong or right, but how loudly Sir Alex or twitchy moans !) and the system stinks ! rant over !! for now !!!!!! Simple rule of football: when presented with chances, score them. The BBC website in match weblog said: ‘I hope arsenal missing these chances doesn’t come back to haunt them’ or something like that. Conclusion: Arsenal didn’t take their chances, so hadn’t put the game to bed. Go do a review on QPR:Norwich. I think you’ll find a 1-0 turned to a 1-2 after a dubious sending-off. It’s not just Arsenal who get the wrong decisions, you know…. No charge for Arsene, thankfully. Rhys: you are missing the point. Walter’s work doesn’t show random fluctuations in terms of refereeing mistakes due to incompetence. How do you explain the first half – second half patterns that he has sometimes shown to exist? There was a time when I used not to understand wengers lack of emphasis on defence, much as I enjoyed the great football. And then the desperation to keep cesc and nasri, against all odds. Then the reported massive bid for gotze, if true? Most unlike wenger the latter. However, it is starting to dawn on me that wenger is aware of the bias and corruption and has been for some time. He needs these special players, not only to unlock teams who park the bus, but more importantly, to out score these teams, no matter what the refs try and do. Usually, if you hit three, four, five goals, even a biased ref can do very little, without making yourself look obvious as dowd did, and they were forced to suend him. Defence is important, but if possible, massively out scoring your opponent is vital in such circumstances. This team are not yet the sort who will go out and hit a team regularly for four or five goals, especially with our fbs out, and our wide players struggling a bit accordingly. These refs know that at the moment, even with robin, we can be limited to a goal or two in each game, this gives some of them their chance. We were jaded at fulham, the ref took advantage. The future, jacks return will help. A fully fit diaby will help. Our fbs, improvements in the wide players, Rambos development will help, as will hopefully, the vastly experienced th12 as he will be. The rumours doing the rounds, th12 joining the coaching staff. Maybe another attacking flair player in the summer. I believe next year, wenger will go back to all out attack, and invite these refs to do their worst. At the moment, injuries mean we cannot do that. In the meantime, wenger, Ivan and the clubs lawyers should approach the fa, pgmol, epl with a dossier of evidence against the likes of probert, this evidence clearly exists as does the history, after all there was an apology with this ref. it should be done behind closed doors and accompany a firm request that the likes of probert are kept away from this club until such a point they can be seen to officiate us without bias, in the case of probert, that will clearly only be a situation found in some parallel reversed dimension. If they refues, the club need to open the can of worms, whatever the consequences. I would add that it’s high time for a Fair Play on the Pitch petition (FPP) to protect players, teams rightful positions in the table based on merit, and ensure that we keep our players and continue to attract new ones who otherwise will think twice before staying/coming to AFC because we/they are so targeted with such impunity. When Walter was having problems connecting to the still offline PGMOL website (and their refworld website is also screwed up), I seen something. It took a while for it to clue in. PGMOL gets some kind of assistance from a company called Prozone Sports. From descriptions, it sounds like it could include the kind of training the mickster (and Graham Poll) was talking about. If Prozone Sports isn’t providing this kind of training to PGMOL (and if you read about the company, it would seem they could do this), why not? Not that there is anything sinister in it, but it looks to me like the PGMOL and RefWorld websites are being run by PremierLeague.com (the Barclay’s Premier League). Can’t PGMOL take care of their own website? If you look a bit harder into Prozone, it looks like most football teams are using their services. That looks suspicious. [Sarcasm]Oh, how much will it cost for us to get a copy of all the data you get analysing Arsenal’s tapes? [/Sarcasm] Does industrial espionage happen in professional football? But, if Prozone is analysing a lot of information for the top teams, and supposedly Arsenal is one of them, wouldn’t there be information there that would help a referee manipulate a game? Is that the service that Prozone Sports is providing to PGMOL? Please provide a direct link to your review of Probert last season. There will be more parallels and I think by being alert to the continuities and providing readers with links, you will be doing us all a real service. Your past work, including the end of season ref review, is still relevant big time, and should be made accessible by a special link on this website, not lost in the UA archives for people who don’t even remember or know that it exists. Keep up your tremendous work, part of which is to underline the parallels which you documented in the past and which, alas, continue through to this very moment. Yes, we know, when presented with chances, score. Thanks to that my insight into football has soared. I’m also grateful for your courage in focusing away from the travesty on the pitch. You see they co-exist the two. But how do you comment on that? By pointing out that other sides are also hard done by, as if this Probert performance and all the rest in the present article, and countless others before it aren’t part of a pattern. I continue to take the high road, sir, although your words, this time, have worn out further patience. The gentleman did not miss the point. That’s the point. Your rant is always welcome to these eyes and ears. Spot on! Has Mr Jaggar done his research for the last 4 seasons- as we have done- and found a week by week bias against Arsenal- often by several hundred per cent. Statistically that cannot happen unless there is an agenda to make it happen. We are NOT talking about chances or results. We are talking about cheating- that is -unfairness which is beyond statistical probability. 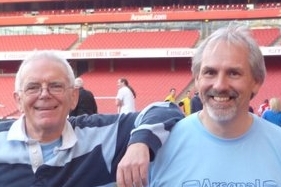 When Mr Jagger has gone through several hundred games and compared the Arsenal performances of Dowd, Dean, Probert and Atkinson against their control of non-Arsenal teams —let him speak! Till then, accept the possibility– Arsenal are being shafted out of 20 points every season! When his research has been done- he will know it is a fact!!!!! There’s an acronym for people like Rhys in my country, invented by the great, late Fela Kuti. ‘Opposite People’, they just take a different opinion, in the face of obvious truth, from everybody else. if the ref’s decision is against a particular team, it makes no difference whether the ref is corrupt or incompetence, end result is the same. That’s why I always say the club/manager has to come forward and be vocal about any ‘injustice’ against our team. To hell with FA rules and penalties, the club got fined , Arsene got a suspension, so what ? Do it each and every time, let them know Arsenal is no push over and be bullies against the wall. In this age of fast and furious football as the EPL, a nice gentleman just doesn’t cut it anymore. Walter I was thinking the same thing as you when I saw the performance from the Ref the objective this year is keep us out of the top 4. What I dont understand is the fact that the ammount of money is so BIG for every 3 points gained when it comes to relegation and top 4 places that clubs dont do anything about results like newcastle last year and to a lesser extent yesterdays games. Why does no one build a case against them pay private decetives etc and find out why all the Refs are northern why there isnt a fair and level playing field for all clubs. Force the pgmol to become transparent when it comes to the organistaion they paid to review them so we can see all the results of the feed back etc and what they done about the feed back. If I owned Arsenal illegal or not their phones would have been tapped by now. I dont understand how clubs take these decisions week in week out and do nothing. You guys here at untold can see its wrong and are trying to do something through highlighting the issues why are Arsenal football club sitting on their backsides doing nothing. Dowd is nearing 50 while Poorbert is somewhere in the early 40s so may be its gonna be Poorbert after Dowd. I don’t really think we can do much other than sit back and watch these things wreck Arsenal. May be Wenger can also give some kind of hitbacks like the one after the previous match or else we would be mute spectators. Somewhere there Arsenal FC should start doing what you people are doing here. Go to the media with specifics armed with evidences like the handballs that have been denied for us. May be Arsenal or some of its ex players should go into the media often and pin point these flaws. Arsenal FC cannot do the same but ex players. They can always do this. The more its talked the more the press will have to cover and the more these will be talked about. The more the people talk about it the more it will be covered and the more radical the changes will be. While I was checking about Poorbert, I found this link. Seems like Lee Probert has played havoc with the fortunes of QPR too. Ah the coincidence QPR happens to be another London side. In the history of the EPL or professional football pre-EPL, does anyone know of even ONE instance if a game was reversed/ overturned based on a protest; and, if so, what were the grounds and process for the reversal? Beyond that, is there any grounds for reversal short of smoking-gun courtroom-proof evidence of referee malfeasance? Does anyone know if in EPL or pre-EPL history there was ever ONE result that was overturned/reversed on a protest? If so, what were the grounds of that protest? And, beyond the history, are there any legal grounds – short of a smoking-gun confession or eyewitness to referee malfeasance in match fixing? @Prasanna: I am totally agree with you. And I think that WE, the (informed) Arsenal fans, have to take our responsibility too. We have to talk about these crimes more and more, not only here but everywhere else that we can, with clear evidences, to draw the attraction of everybody. To let them know how stink they (the FA and the refs) are. @Laundryender: did you manage to get to The Riley last night? 5Live Sport, Ask the Ref., 21:00, Wednesday, 4th January, 2012. Well said Dave Right, I only heard part of the Riley interview but his answers evasive and non-committal. I did garner the PGMOL chose the right refs for the right games or is it the right refs for the right price?